“Make friends, not enemies,” the A’s fan said. Hey look, it’s these guys again. The unlikely twist to the story of the Yankees fan who threw a beer on an A’s fan at the Wild Card Game was that the two guys ended up going out clubbing later that week. And wouldn’t you know it, they got together again. The two guys attended last night’s ALDS Game 4 together, in the same section where the beer-throwing occurred. The A’s fan (John) said that the Yankees fan (Chris) actually bought his ticket to the game. It’s cool to see that these guys don’t want to fight each other but there’s a small part of me that thinks they’re just capitalizing on their 15 minutes of fame. John is up to nearly 5,000 Twitter followers (from just a few hundred before the incident) and Chris has nearly 10,000 followers on Instagram (nearly 10 times as many as he did this time last week). If they go to Opening Day together, then I won’t be so cynical. The bottom of the ninth inning of last night’s game was as thrilling as any I can remember. But maybe I’m just biased because I was in the stadium (or maybe not—SB Nation’s Grant Brisbee agrees). The crowd sounded like a jet engine the entire inning and you have to think that was part of the reason Craig Kimbrel struggled so badly. 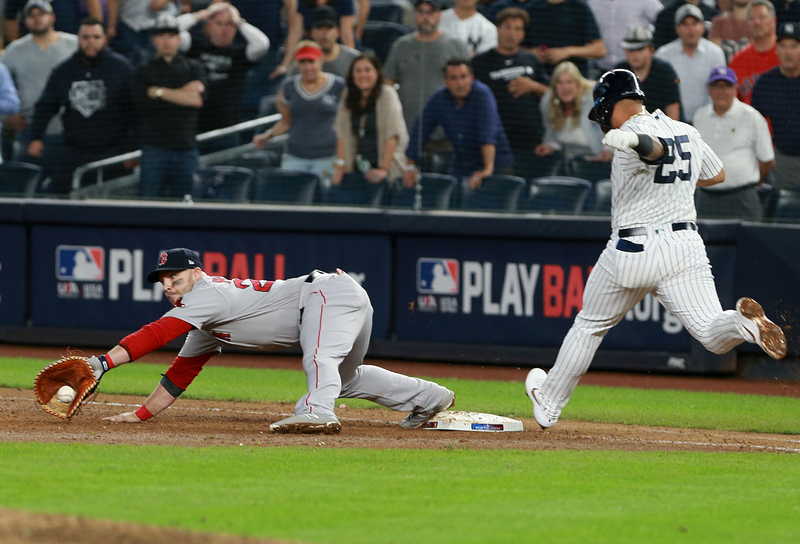 In the end, it took great plays by Eduardo Nuñez and Steve Pearce—two below average defenders—to get Gleyber Torres out by just a few inches. The Giants responded to their Lil Wayne pseudo-controversy by playing Lil Wayne at practice yesterday. ... The Texans just signed a guy named Mike Tyson. ... A team of treasure hunters is accusing the FBI of hiding evidence of lost Union Army gold. ... The Tigers broadcasters who got in a fight last month won’t be returning to the booth next season. ... Syracuse’s Carrier Dome is named after an air conditioning company but has famously never had air conditioning. That’s about to change with a new renovation. searches related to 'Ponzi scheme' and 'Ponzi' in the months before his arrest." Jury selection for the former radio host’s trial begins at the end of the month. "You can't have motherf*****s around you that don't keep it honest with you and keep it real with you"